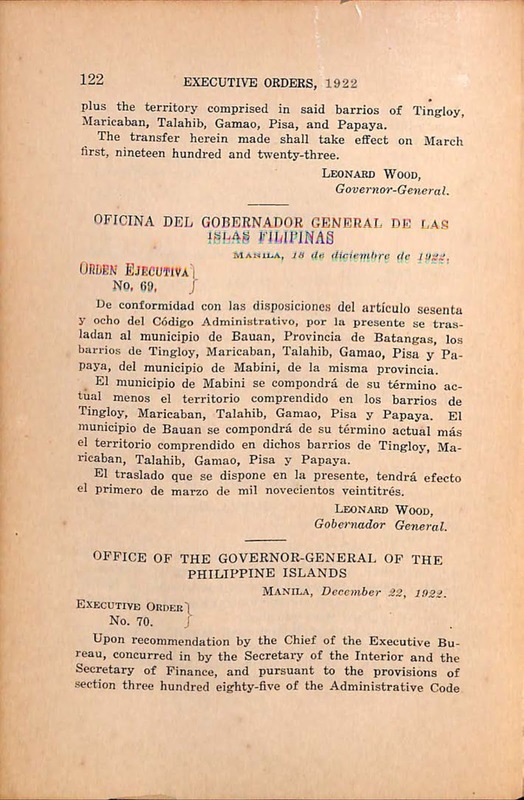 The present-day Municipality of Tingloy was like a volleyball being tossed from one town to the other during the American colonial era. 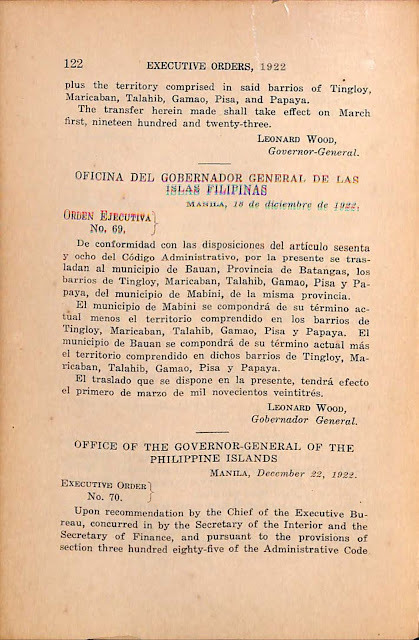 In 1918, the then-barrio of Tingloy along with a few others presently associated with the modern-day town was taken from Bauan and became part of the newly created town of Mabini. Pursuant to the provisions of section sixty-eight of the Administrative Code, the barrios of Tingloy, Maricaban, Talahib, Gamao, Pisa, and Papaya, municipality of Mabini, Province of Batangas, are hereby transferred to the municipality of Bauan, same province. 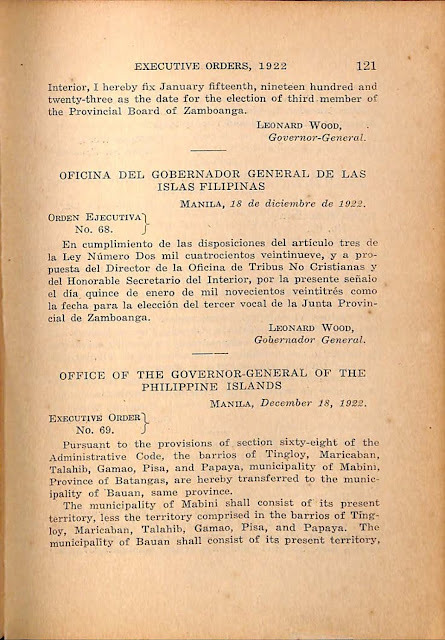 The municipality of Mabini shall consist of its present territory, less the territory comprised in the barrios of Tingloy, Maricaban, Talabib, Gamao, Pisa, and Papaya. 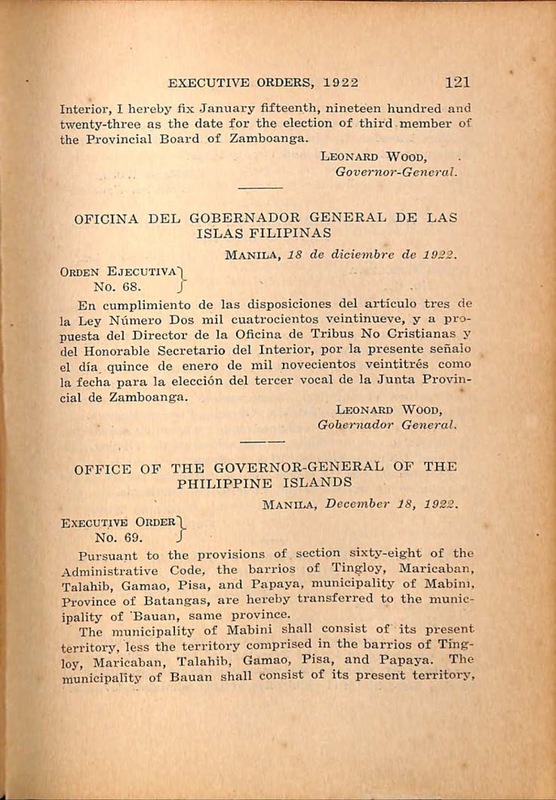 The municipality of Bauan shall consist of its present territory, plus the territory comprised in said barrios of Tingloy, Maricaban, Talabib, Gamao, Pisa, and Papaya. The transfer herein made shall take effect on March first, nineteen hundred and twenty-three. Executive Order No. 69 series 1922 English version. Executive Order No. 69 series 1922 Spanish version.